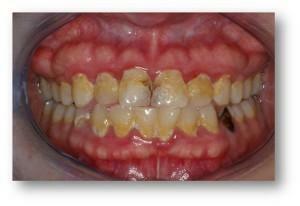 When we take a look at the way a patient’s biofilm impacts their caries risk, we are learning more and more every day. We know that patients with either too much plaque or an overly-active biofilm are at higher risk, but what do we know about individual species of bacteria and how they play a role? In this study, they looked at the inside of active caries lesions and then on sound surfaces. They found that the most bacterial activity (growth, population numbers present) inside the lesion was lactobacilli. On the sound surfaces where there was no carious lesions, the highest activity was Fusobacteria. Identifying the different bacteria on healthy surfaces vs. diseased surfaces can further our understanding of how this disease functions. Dental caries is a multifactorial disease with many associated microbial taxa, but only a few are notably contributing to acidogenicity. The ribosome number and the corresponding 16S ribosomal RNA (rRNA) concentration are considered a molecular indicator for general metabolic activity of bacteria, as they are elevated with increased anabolic and catabolic activities. We hypothesize that the activity of aciduric/acidogenic bacterial taxa, reflected by a rise in ribosomal counts, could resolve differences between plaque biofilm from sound surfaces and caries lesions. The included subjects were allocated to two groups: caries-free (CF) or caries-active (CA). CF subjects presented one donor site, namely one sound surface (CFS, n = 10), whereas CA subjects presented two donor sites: a cavitated lesion with an ICDAS score of 5-6 (CAC, n = 13), and a sound reference surface (CAS, n = 13). Four aciduric/acidogenic bacterial taxa (Streptococcus mutans, lactobacilli, Bifidobacterium dentium, and Scardovia wiggsiae) and one asaccharolytic taxon (fusobacteria) as a contrast were selected. 16S rRNA and 16S rRNA genes were quantified by quantitative PCR. Based on these parameters, bacterial and ribosomal counts, as well as relative activities were calculated as the quotient of relative ribosomal abundance and relative genome abundance. Caries-associated bacteria showed the highest relative activity in caries lesions (e.g. lactobacilli CAC: 177.5 ± 46.0%) and lower activities on sound surfaces (e.g. lactobacilli CAS: 96.3 ± 31.5%), whereas asaccharolytic fusobacteria were most active on sound surfaces and less active in caries lesions (CFS: 275.7 ± 171.1%; CAS: 205.8 ± 114.3%; CAC: 51.1 ± 19.0%). Thus, the present study suggests different activity patterns for biofilms from CF and CA individuals. (Henne K, Gunesch AP, Walther C, Meyer-Lueckel H, Conrads G, et al. Analysis of Bacterial Activity in Sound and Cariogenic Biofilm: A Pilot in vivo Study. Caries Res. 2016;50(5):480-488).